This was the first photo. Not the first photo I’d ever taken, of course. Like everyone, I’ve taken snapshots for as long as I can remember. First with film on instamatic cameras and then more snaps than a person should take using my iPhone. No, this was the the one that told me my teenage self was right. This was the one that told me I see things in the everyday that others may not. This was the one that pushed me to do more than just snap with my iPhone. This one was my inspiration to buy a real camera and take photography lessons. It’s not my best one. It’s not my worst one. But it’s the first one. That was two years ago. It’s taken a while to get myself up and actually doing what this photo inspired me to do, but I’m doing it. Even though I’m still learning and my photo’s have a ways to go, I decided publishing them would give me the nudge I needed to practice. 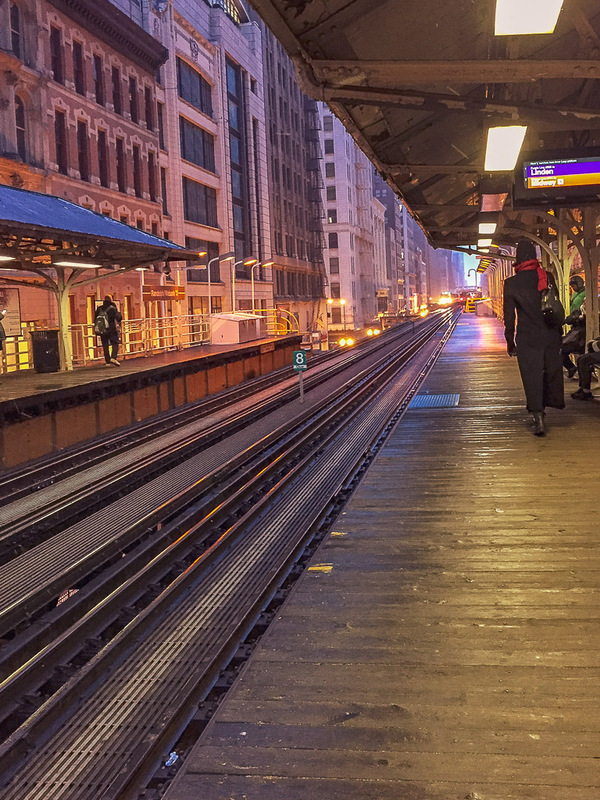 This photo was taken in Chicago on the Randolph/Wabash L platform. The night was cold and windy and I was already anticipating the whoosh of wind from the approaching train. I noticed the colors – the red scarf, the green “8”, and the blue awning, and I had to have that photo.